Denver Broncos quarterback Peyton Manning has described the allegations as "complete garbage"
Allegations that American football legend Peyton Manning took human growth hormone should be investigated, says the World Anti-Doping Agency (Wada). Wada also described the allegations, which Manning dismissed as "complete garbage", as "very concerning". 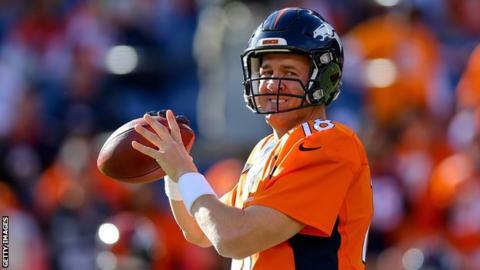 Al Jazeera reported that Denver Broncos quarterback Manning was treated with human growth hormone (HGH) during his recovery from neck surgery in 2011. Its source - Texas-based pharmacist Charlie Sly - has since recanted. The Al Jazeera documentary linked players from the National Football League (NFL) and Major League Baseball (MLB) with performance-enhancing drugs. "Al Jazeera's allegations are very concerning, particularly as it relates to the NFL's and MLB's testing programmes," David Howman, director-general of Wada, said in a statement. "While the NFL and the MLB are not signatories to the world anti-doping code, in recent years Wada has been working with them and other professional leagues in the United States to try to bring them closer to Wada's programme. "As it relates to the particular allegations by Al Jazeera, Wada expects that they will be carefully investigated by the relevant authorities and that, if warranted, necessary and appropriate steps would be taken." The NFL collective bargaining agreement, ratified in 2011, banned HGH but players were not tested for it until 2014. No NFL player has tested positive for HGH. MLB said it would investigate allegations made in the documentary that several of its players took banned hormone supplement Delta-2.